Buying a Claddagh ring in Ireland is very easy. Go to any jewelers and you will find a whole array, in gold, in silver, with or without inlaid diamonds, emeralds or your birthstone. The most traditional place to buy your ring is in the city of Galway, on Ireland's west coast.There is no shortage of jewelers in Ireland, whether you are in Dublin, Cork, Galway or any other city. They all sell these rings. You can also find them in souvenir shops. Claddagh was Galway's fishing village. The fishermen went out to sea in hookers, traditional sailing boats with rust-coloured sails. They lived in white-washed cottages with thatched roofs. Both men and women wear these rings and always have. 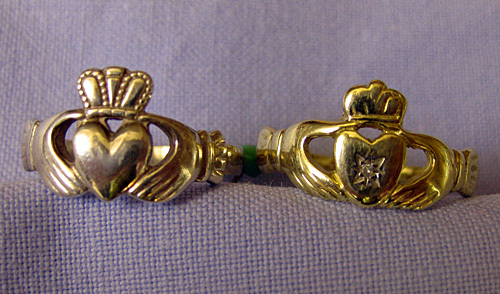 Claddagh rings are both wedding and friendship rings. They depict a crowned heart nestling between two outstretched hands. The hands signify friendship, the heart stands for love and the crown represents loyalty. The way the ring is worn has as much meaning as the symbols carved in it. It shows if someone is single, dating, engaged or married. Single: the ring is worn on the right hand with the heart facing away. When you look down at your hand, the heart is upside down. Dating: the ring is worn on the right hand facing towards you. When you look at your hand, the ring is the right side up. Engaged: the ring is worn on the left hand with the heart facing away. Married: the ring is worn on the left hand facing towards you. If you haven't planned a visit to Ireland, haven't a suitor to buy you one but still want to wear a Claddagh ring, the problem is easy to solve. Find your ring size at Ring Sizer and order your favourite Claddagh ring from Amazon.com. There is no shortage of jewelers in Ireland, whether you are in Dublin, Cork, Galway or any other city. They all sell these rings. You can also find them in souvenir shops. Nice post with nice concept..!! Good information on how to and where to buy Irish Claddagh Ring...!! !